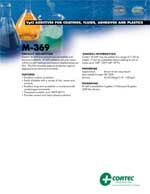 Description: Cortec® M-369 is an oil and wax compatible anticorrosion additive. M-369 added to oils and waxes will form a self-healing and moisture-displacing barrier film. This film provides superior protection against aggressive corrosive environments.